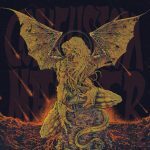 Dubbing themselves as “Electric Sabbath action Doom deep down soaked in a time spiral measuring equal parts 70ies Sabbath proto rock riffage in a loop scheme backbeat groove formula and tritonous stoner weed” Confusion Master have been brought to life in Autumn 2015 right at the northern misty shores of Rostock/ Germany by the Baltic Sea. Confusion Master is a band – 4 guys, drawn from Punk and Metal circuits, sharing their love for sound, misanthrophy, D.I.Y. values and vintage gear. The members have earned merits in underground stalwart hordes such as CYNESS, WOJCZECH, BAD LUCK RIDES ON WHEELS and AEQUATORKAELTE – this alone should give you a hindsight towards the fact that we are not talking a bunch of greenhorns here but a band that has vision and attitude. Confusion Master have been presenting themselves as a veritable touring machine in support for bands like Like Rats, Dopethrone, Crowskin, Bongzilla, Beehoover and labelmates Black Shape Of Nexus and are set to lay waste over the 2019 edition of the mighty ROADBURN Festival. Their debut album was released in 2018 on the fine label whose pages you are currently browsing here. More to come.